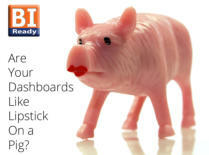 Whitepaper - Are Your Dashboards Like Lipstick On A Pig? If your data is in a mess, then no matter how good your dashboard reporting tool, your project could be hamstrung. Download our free whitepaper on why BI projects fail, and how to prevent failure. Then call us for a no-obligation demonstration of BIReady. You will believe pigs can fly! To access our Whitepaper area requires a one-time registration. Upon registering you may immediately access our whitepapers and receive future notifications on new whitepapers as they are published. Complete the form below to register. Please enter your email address below to access our whitepapers area and to receive future updates about new whitepapers and other events. Note: In any email you receive from us, there will always be a link to unsubscribe which guarantees the permanent removal of your email address from our mailing list. Your privacy is important to us. Are Your Dashboards Like Lipstick On A Pig?